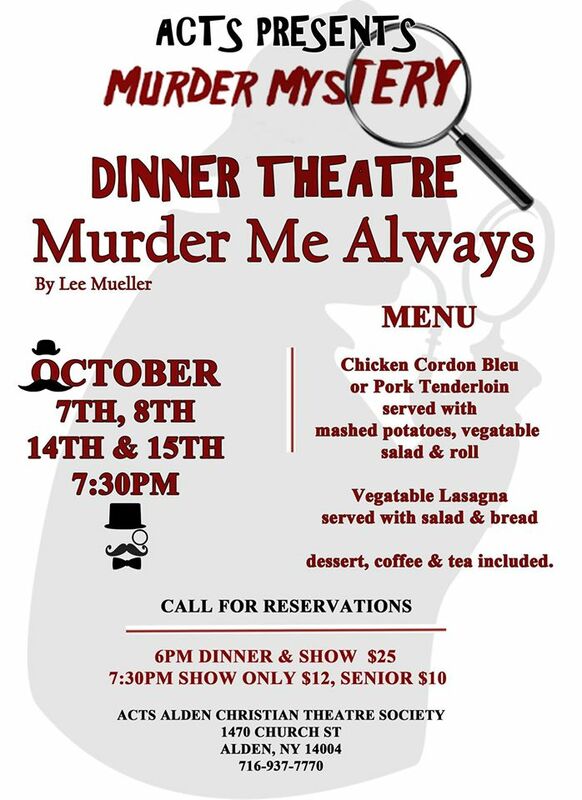 ACTS - The Alden Christian Theatre Society, 1470 Church St. in the Village of Alden, will present a dinner theater production of “Murder Me Always” by Lee Muller, a comedy murder mystery show, on Fridays and Saturdays October 7 & 8 and 14 & 15. The dinner will begin the evening at 6pm. Tickets are $25 for the dinner and the show and must be purchased in advanced to reserve seating. The dinner entrée choices of pork tenderloin or chicken cordon bleu will be served with salad, potato, vegetable, or vegetable lasagna and salad. All meals include desserts and drinks. The comedy murder mystery will begin at 7:30. During a very bad performance of "Murder Me Always", an actual murder takes place off stage. The director is shot. The "fake" play comes to a screeching halt and a "real" murder mystery begins. It seems a "Murder Mystery Murderer" is on the loose and has struck again. Luckily, a 1940s pulp fiction type gumshoe has staked out the audience and rises to the occasion to begin an investigation. Could it be that one of these very bad actors is really a very bad person? Will this "real" murder mystery be any better than the fake one? Is art imitating life? Is the play really the thing? 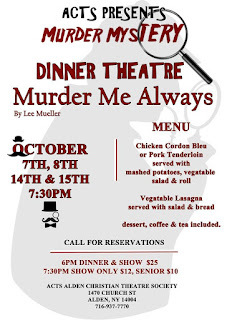 Don’t miss your chance to figure out who the murderer is while laughing all evening. Limited tickets are also available to those who cannot make the dinner but still wish to see the show. Tickets must be purchased in advance for the 7:30 show $12 general admission and $10 for seniors/students. Call ACTS to purchase tickets for dinner and to reserve tables or for tickets to see the show at 937-7770.